Characterized by a long stretch of attractive ghats, arched gateways and lofty temple spires along the bank of the River Yamuna, Mathura is an important pilgrim destination of India and is flocked by thousands of pilgrims and tourists. It is the nucleus of Brajbhoomi and also the birthplace of one of the most revered incarnations of Vishnu-Lord Krishna. Dwarkadhish Temple, Krishna Janambhoomi and the Government Museum are the major attractions of this town. With growth of tourism in Uttar Pradesh, Mathura has gained immense popularity and this has consequently led to more and more tourists dropping in here. Hence, the transportation network is greatly improved now and reaching Mathura is convenient by the air, rail and road transport. The transport has been greatly improved and now Mathura is well-connected with not only the nearby but the major destinations of India. For the tourists who want to reach Mathura by air, the nearest airport would be at Kheria in Agra located at a distance of 60 km from Mathura. The major public and private carriers operate to and from Mathura and link the important cities of India such as Mumbai, Kolkata, Chennai, Bangalore and Ahmedabad. Access to Mathura is made easier by rail transport as the tourists can travel from the nearby towns of Mathura and also from the important cities of India including Delhi, Mumbai, Jaipur, Gwalior, Calcutta, Hyderabad and Chennai. Mathura is located on the main lines of Central and also the Western Railways. The services of express as well as super fast trains are available on a routine basis thus making travel to Mathura by rail transport very easy. Getting to Mathura by road transport is equally convenient today. If you want to enjoy the drive through the smooth and efficient network of the state and national highways then road transport is the best way. 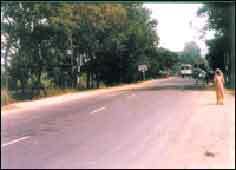 Mathura is located on National Highway-2 and links the major towns such as Lucknow, Kanpur, Agra, Delhi and Jaipur. The state transport is quite efficient and connects the nearby destinations through the prompt bus and luxury coach services.